Trailer Donations Continue To Help NRECA International - Sauber Mfg. Co.
2016: This year we worked with the Project Construction Manager at Pilot Project for Sustainable Electricity Distribution (PPSELD,) Caracol, Haiti. 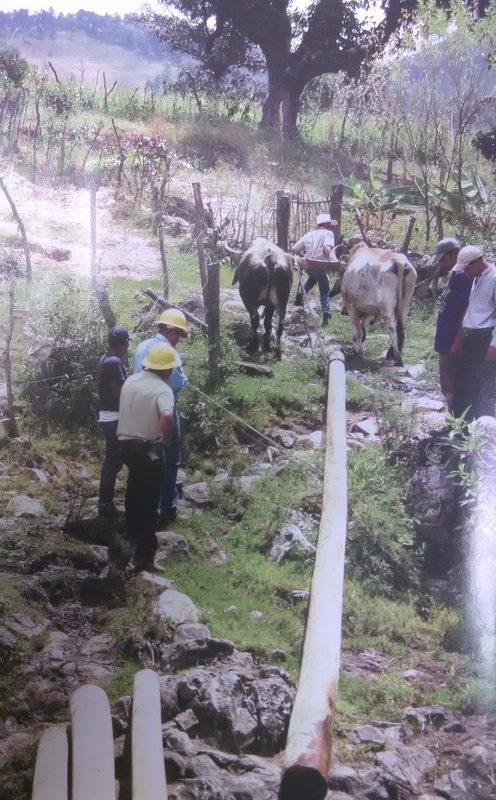 We designed and built a Model 4501 Pole Dinky to help aid in this $24 million contract to establish and operate the electric utility in Caracol, Haiti. PPSELD is a three-year undertaking to establish a self-sustaining generation-distribution utility that will expand service to include Limonade, Terrier Rouge, and Trou du Nord that are in close proximity to Caracol. In future years, PPSELD may expand service to additional communities if USAID and the Government of Haiti provide approval. The project is an incredible opportunity for both NRECA International and local counterparts to create a true example of a successful electric utility in Haiti. Reliable electricity in this region of the country will empower local entrepreneurs and community leaders to improve their communities and pave the way for new technology and growth. Below, some Sauber employees representing different areas of our operation pose with the donated trailer prior to shipment. We’re happy to help bring electricity to those in most in need. Update 2013: We’ve just completed the Model 4410 Pole trailer to be donated to the utility company in Puerto Barrios, Guatemala. This trailer will no doubt be used in conjunction with one of two vehicles recently donated by Central Alabama Electric Cooperative, (a Digger Derrick) and Southeastern Indiana REMC (a Bucket Truck!) Link here to see an informative video of the work being done there. The photo below illustrates the current method of transporting poles – via oxen. The equipment being deployed this year will radically change things for this struggling area, and Sauber Mfg is proud to be a part of it. 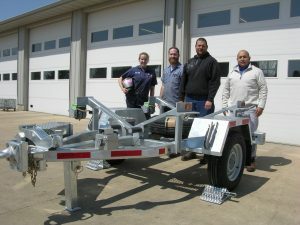 2011: A new Pole Trailer, valued at $17,297 was recently built by Sauber Mfg. 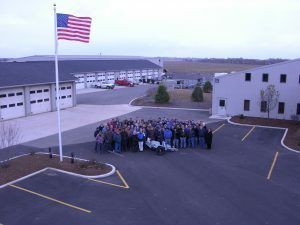 Co. employees at their plant in Virgil, Illinois and has been delivered to the Philippines. The unit featured a 15,000 lbs. dual wheeled undercarriage, hardwood lined bolsters, galvanized finish and a cargo bed. The images show the trailer as an important work tool and a source of pride in a local parade. 2010: For our first partnership with NRECA International, we built a new Pole Dinkey for deployment into Haiti, one of the poorest countries in the Western Hemisphere. This piece of equipment, combined with donations of other equipment and manpower, is helping to electrify the town of Pignon. Sauber’s marketing manager, Mike Blaser brought the opportunity forward after reading an article in Rural Electric Magazine. Jim Sauber, president said “What a great way to help our international neighbors enjoy the elevated standard of living and education that electricity can provide. Our employees are part of this gift and are right there with us in support of it.” The company’s hope is that this will be an annual commitment that can also encourage participation by other industry leaders.